If you're accustomed to riding in comfort and arriving in style, but need the cargo versatility of an open pickup bed, the Mark LT might be the answer to your dreams. If you're looking for the latest in luxury and safety, the Mark LT's lack of available side-impact and head-curtain airbags, as well as stability control, places it behind the Cadillac Escalade EXT. The 2007 Mark LT receives a new grille and headlamp treatment as well as more chrome around the rear taillights, bumpers and doors. An auto-dimming driver's sideview mirror becomes standard, while new options include DVD navigation and a six-and-a-half-foot bed. Upgraded less with wood and more with chrome and leather, the Mark LT's contemporary, stylish and comfortable interior is better described as modern than plush. The sophisticated design rivals the new Cadillac Escalade EXT's cabin, and neat stitching on the leather-covered shift lever is a nice touch (even if it isn't really hand stitched). Whether you find the contrasting piping on the seats stylish or not, you'll appreciate the well-cushioned comfort those seats offer. Rear-seat passengers are also in luck, as full-size rear doors open up to full-size rear legroom. Start with a Ford F-150 SuperCrew, add a big chrome grille, big taillights, more chrome and nicely-styled 18-inch wheels, and you've got the Mark LT. The five-and-a-half-foot-long cargo bed is deep and wide and should provide plenty of room for the Mark LT's most truck-like tasks, but if you need more room, a six-and-a-half-foot bed is available. The mechanically-assisted tailgate is easy to open and close. For a luxury vehicle capable of towing a very sizeable boat or horse trailer, the Mark LT delivers an acceptably smooth and quiet highway ride. Like many traditional luxury vehicles, however, this heavyweight rides better than it handles. Putting the throttle all the way to the floor won't deliver startling performance, but the powerful V8 and four-speed automatic transmission work well together in delivering smooth acceleration that's more than adequate around town or on a highway cruise. As long as you climb into the cab with an appreciation (and maybe a need) for the Mark LT as a fully functional pickup, you should find it plenty luxurious. In two-wheel-drive layout, the Mark LT has a Manufacturer's Suggested Retail Price (MSRP) of $38,995, while the four-wheel-drive model is $42,095. A fully-loaded Mark LT with the extended bed tops out around $52,000. The Cadillac Escalade EXT, the Mark LT's most direct competitor, starts at $54,605, but for the extra money the Cadillac includes a more powerful engine, full-time four-wheel drive, folding "Midgate" system, side-impact airbags and stability control. As always, be sure to shop and compare using current Fair Purchase Prices, which reflect real-world selling prices. In terms of resale value, over a five-year period we expect the Lincoln Mark LT to hold lower residual values than the Cadillac Escalade EXT. Included as standard on both the two- and four-wheel-drive Mark LT is a 300-horsepower V8, a four-speed automatic transmission, leather seating, ebony wood trim, power and heated front seats with driver's-side memory, easy-lift tailgate, AM/FM/6CD/MP3 premium sound system, Electronic Automatic Temperature Control, electronic message center, remote keyless entry with door keypad and integrated garage opener. Safety equipment includes front airbags and four-wheel anti-lock disc brakes (ABS). Upgrading to the four-wheel-drive Mark LT adds only the shift-on-the-fly four-wheel-drive system. Also available are a rear-seat DVD entertainment system, DVD navigation radio, 20-inch chrome wheels, power sliding rear window, power-adjustable pedals, power moonroof and a Reverse Sensing System. Standard on the Mark LT is an impressive AM/FM/6CD/MP3 sound system that delivers crisp, powerful music through six speakers and a subwoofer. The Mark LT's large tailgate features a built-in torsion bar that makes both opening and closing it surprisingly easy. The only powertrain decision to make when purchasing a Mark LT is between two- or four-wheel drive. Although four-wheel-drive costs about $3,500 more, the enhanced traction helps to offset the truck's lack of an available stability control system. The Mark LT offers legitimate, truck-like hauling and towing capacities of 1,620 pounds and 8,600 pounds, respectively. Unwilling to watch Cadillac's Escalade EXT go unchallenged, Lincoln has created a luxury pickup of its own. Based on the popular Ford F-150, the Mark LT combines the plush interior of a Lincoln sedan with a versatile pickup bed perfect for hauling jet skis, ATVs or a new 50-inch flat-screen TV. Available only in a Crew Cab configuration, the Mark LT features a long list of standard luxury amenities and offers the option of four-wheel drive. 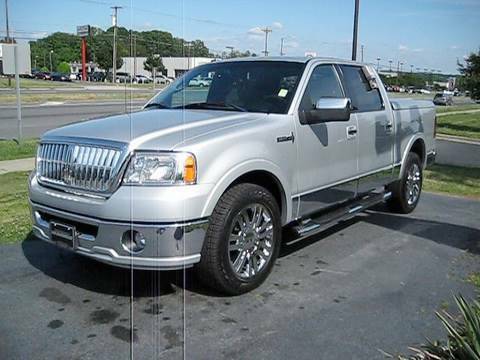 Whether the Lincoln name carries enough clout to justify the extra cost over a loaded King Ranch or Harley-Davidson Ford F-150 is yet to be seen, but in a country where status is sometimes everything, it's a good bet the Mark LT will find enough buyers to keep the production line up and running. That it is no longer in production and the closest replacement would be the Ford F 150 Platinum. Cons This vehicle is no longer made. The disk for onboard gps is expensive. Pros Comfortable for a truck. Has most of the extras that I would want such as power sunroof, cruise control, power seats, really like the heated seats, leather interior and keyless entry. Has been a good truck for me. that it is avery nice truck that rides like a car. This is the best pickup I have never had it has cruise control , navigation system Leather seats,console with floor shift Cd player that holds 6 cds. really a fun truck.